An article in The Jakarta Post chronicles the path that led Mauliddin, an SRI farmer from Aceh, to receive a prestigious national achievement award for rice farmers. According to an earlier article in Serambi Indonesia, Mauliddin, who comes from the village Sampoiniet in the Subdistrict Masen of Aceh Jaya, was scheduled to meet the president of Indonesia, Susilo Bambang Yudhoyono, at the presidential palace on August 17, 2011, in conjunction with the commemoration of Indonesia's independence day. 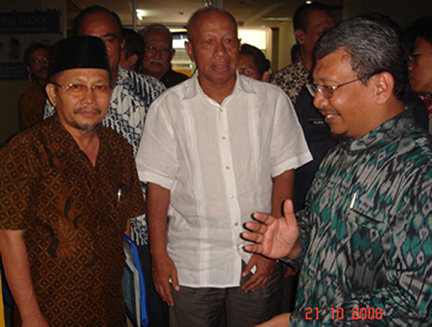 Maulidin learned SRI methods from the NGO Caritas Republic Koruna (CCR), which came to Aceh Jaya in 2008 to help victims of conflict and tsunami. Imam Suharto has shared a new manual prepared for farmers carrying out SRI methods with rainfed rice in the Boyolali Regency of Central Java. Farmers in the Appoli farmer organization in the Andong sub-district of Boyolali have been practicing SRI for about five years. The manual, which is in Bahasa Indonesia, was put together by LSK Bina Bakat Surakarta, a local NGO, in cooperation with VECO Indonesia, a Belgian NGO. According to articles in Ekonomi Bisnis and the ReportLinker website, the Indonesian Ministry of Agriculture will set a target for rice cultivation using SRI methods at 1.5 million hectares in 2015. Hari Priyono, the secretary general of the ministry, said that the System of Rice Intensification is expected to be a solution for farmers to continue efforts to boost rice production with growing scarcity in land for expansion, noting that it would be difficult to rely on expansion of rice fields alone to reach the production target of 70.6 million tons of un-husked rice in 2011. Due to the success of SRI in the past few years in increasing productivity in some areas, Priyono says that the ministry plans to increase the use of the system by phases from 100,000 hectares of rice fields this year, to 200,000 hectares in 2012 and to 1.5 million hectares in 2015. 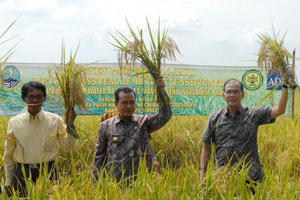 An article in the Pos Kota reported that on March 26 the Secretary General of the Ministry of Agriculture, Hari Priyono, and the head of Karawang Regency, H. Ade Swara harvested rice grown with SRI together with a farmer group in Pasir Kamuning Village, in Karawang Regency's Telagasari District (photo at right). The Karawang Regency is one of the areas with a mandate to adopt SRI through the Ministry of Agriculture's Integrated Citarum Water Resource Management Investment Programme (ICWRMIP). The program includes 68 farmer groups in 27 villages in 6 districts and covers 1,360 hectares. The Minister of Agriculture, Dr. H. Suswono and the Governor of South Sumatra, H. Alex Noerdin, along with other officials, PT Medco staff and community members, attended the Organic SRI Harvesting Ceremony at Embawang, South Sumatra on March 12, 2011. The introduction of SRI in this area was supported by the oil and gas company, PT Medco, through their corporate social responsibility (CSR) program. According to an article in Kompas, 42 farmers (out of a total of 100) in the village of Embawang grew 35 ha of organic SRI. The average yield of organic SRI was 7-8 ton/ha while conventional rice cultivation yield in this area is only 4-5 ton/ha. In addition, this organic rice sells for Rp 10,000-Rp 15,000/kg (US$ 1.14-US$ 1.17/kg) which much higher that the price of conventionally grown rice at Rp 6,000-Rp 7,000/kg (US $0.67-US $0.80/kg). During the coming season, SRI methods will be actively promoted in an additional six villages. The Nusantara Organic SRI Center (NOSC), formerly known as Nagrak Organic SRI Center (NOSC), has signed a one year contract with PT Sampoerna to promote organic SRI in Kerawang, West Java, and Pandaan, East Java. During January 21-27, 2011, a group from the Kedah Regional Development Authority (KEDA) in Malaysia was trained at NOSC in organic SRI methods and in organic vegetable production. On January 25, an MOU was signed between NOSC and the Program of Federal Land Consolidation and Rehabilitation Authority of Malaysia (FELCRA) in Kuala Lumpur to work together further on developing SRI at FELCRA Program sites. (see Malaysia page for more information). 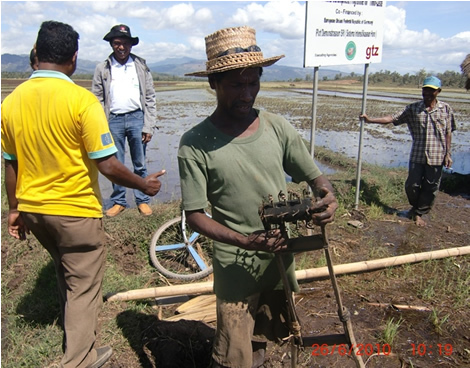 With funding assistance from SRI-Rice, NOSC also sent a trainer, Miyatti Jannah, to the Solomon Islands during October 2010 to train farmers and government extension workers there. Follow up visits are underway during 2011. An article reviewing "strategies and engineering adaptations to disseminate SRI methods in large-scale irrigation systems in Eastern Indonesia by Shuichi Sato et al was published during the March 2011 edition of the journal Paddy and Water Environment. Another article in the journal, "A review of studies on SRI effects on beneficial organisms in rice soil rhizospheres was authored by Iswandi Anas, professor at the Institut Pertanian Bogor, together with several colleagues in India and the USA. Budi Indra Setiawan of Bogor Agricultural University received the PAWEES International Award (far left in the photo) as recognition for a series of fundamental and application studies in the field of soil and water engineering and contribution to the development of agricultural engineering education and society in Indonesia. Dr. Setiawan has been active in SRI research in Indonesia and elsewhere for the past several years. 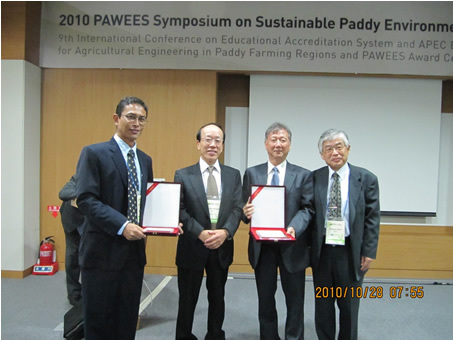 The award was given by the president, Prof. Tsuyoshi Miyazaki, of the International Society of Paddy and Water Environment Engineering (PAWEES) during its annual meeting in Jeju Island, Korea, October 27-29, 2010. During the week of October 11 to 18, 2010, a group from Timor Leste was trained in organic SRI production at the Nagrak Organic SRI Center (NOSC) in Sukabumi, West Java. Prof. Iswandi Anas, coordinator of the Indonesian Association for SRI (Ina-SRI), attended the 2010 national SRI workshop in Timor Leste (photo at left) and reported on a visit to see SRI results in the field (see Timor Leste section). Jose Barros and other Timor Leste agronomists previously received gained experience with SRI methods from the DISIMP research center in Lombok, Indonesia, in 2008, then in 2009 at the PAWEES meeting in Bogor and at the Organic SRI Center in Nagrak (NOSC). Caritas Czech Republic began working with the farmers of Masen Village in October 2008 to establish a demonstration plot for intensive rice paddy cultivation using the organic SRI. According to an article in the Asia Philanthropy Forum, the NGO's 1.2 hectare demonstration plot In Masen Village planted during 2008 grew to thirteen hectares in 2010. Caritas CR's goal is to have the SRI methodology in use in thirty of the fifty hectares in Masen. Staff have trained forty-seven farmers to use the SRI organic method and provides field staff to work closely with the farmers. In a Caritas News article, Dr. Ingvar Anda, Caritas Australia’s Humanitarian Coordinator, noted that SRI improved the yield in Aceh from two tons per hectare to 8.5 tons per hectare; the outcome is even more impressive as many of the farmers move towards two crops per year. The major corporation Sampoerna PT under its corporate social responsibility program is training farmers in SRI methods, with considerable success. It has produced a nicely illustrated manual in Bahasa Indonesia for farmers, and the successes in Pandaan sub district in East Java have encouraged it to expand to other districts in the coming year. 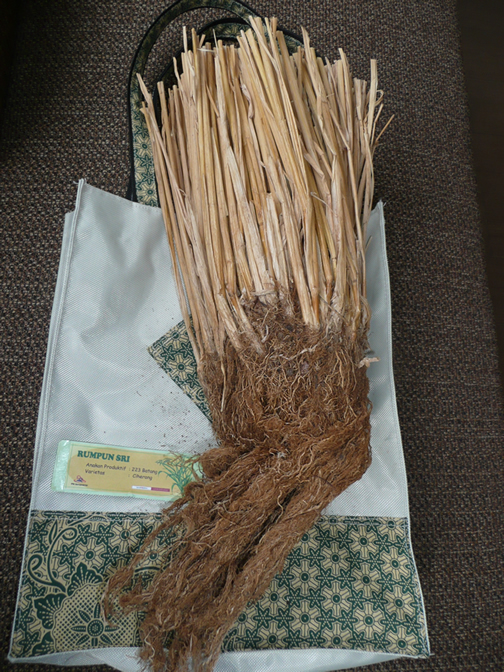 In early October (2009) when Norman and Marguerite Uphoff visited a Sampoerna school training SRI farmers to become SRI trainers they were given a rice plant stump with 223 tillers (shown at right; click on photo to enlarge) to show how successful SRI methods could be when used appropriately. This plant is the first which we have seen which got well into its 14th phyllochron of growth before flowering (anthesis). Bogor, Indonesia, was chosen as the venue for the International Conference on Promising Practices for the Development of Sustainable Paddy Fields that was held Oct. 7-9, 2009. This conference, an annual event of the International Society of Paddy and Water Environment Engineering (PAWEES), was co-organized by the Department of Civil and Environmental Engineering of Bogor Agricultural University, the Indonesian Network of the System of Rice Intensification and the Japanese Society of Irrigation, Drainage and Reclamation Engineering (JSIDRE). Several papers on SRI were included. (see also conference brochure). In 2009, BloomAgro became the international distribution channel for the Simpatik Farmer Cooperative production and processing units located in Tasikmalaya, Indonesia. BloomAgro was instrumental in helping Simpatik, which includes over 2300 farmers cultivating about 350 hectares of paddy using SRI methods, to certify and export rice grown with SRI methods. BloomAgro is exporting finished rice grown with SRI methods the USA and will soon begin exporting to Singapore and Malaysia. Both the Simpatik production and processing units have been certified as Fair for Life by the international certifying organization IMO (Institute for Marketecology), based in Switzerland. The "Fair for Life" designation is regarded as perhaps the most stringent and difficult to achieve in the industry due to the many social and environmental criteria. The rice produced by Simpatik is the only rice to be certified as Fair for Life by IMO. In fact, Simpatik scored higher than the norm, in large part due to the many environmental benefits generated by farmers using SRI, such as water savings and soil conservation. All the criteria and scores can be viewed at the IMO website. An SRI Training of Trainers Project conducted in Bali by Chakra Widia was funded by The Funding Network (TFN) with involvement of two Rotary Clubs in Ubud, Bali. The project began in November 2007, and as of June 2008 has trained 32 farmers from 10 different subaks in the use of SRI. Improved harvests from this first phase have shown SRI to have great potential. During January 2009, a video by the Paradigm Project featured Chakra Widia and his new NGO, Tri Hita Karana Bali, which will carry out additional SRI projects in Indonesia. (See also article about the NGO's SRI projects). The Asian Development Bank (ADB) has agreed to provide US$ 3 million in loans to support rice development in three districts of West Java through the System of Rice Intensification (SRI), starting in 2009 (see article in Antara). The investment will be handled through the Ministry's Directorate of Land Management, which has been supporting farmer training for organic SRI production with its own funds since 2007. The ADB loan will permit the Ministry to accelerate its SRI promotion, especially of organic SRI production, which has already started in 28 districts in almost half of the country's 33 provinces. SRI methods are being disseminated in Indonesia also by several other government agencies, by a growing number of NGOs and universities, and by several private sector entities. The Minister stated in his remarks that the government's program to raise national rice production through integrated crop management (PTT) is actually a modification of SRI. (Evaluations and adaptations of SRI began at the Indonesian Institute for Rice Research at Sukamandi in 1999.) Inasmuch as PTT and SRI are basically the same, he said, there should be no competition between them, and they should be adopted according to farmers' wishes. The first day, attended by over 300 farmers from Aceh in the west to Papua in the east, was devoted to farmer reports on field experience with SRI methods from across Indonesia. Workshop participants in total numbered more than 500 persons, including former Environment Minister Dr. Emil Salim; former Minister for Transmigration and Labor Dr. Siswono; former Governor of West Java Mr. G.P. Solihin; and Ir. Arifin Panigoro, head of one of Indonesia's largest companies who has been supporting SRI spread through his private foundation (Medco). Workshop participants agreed that SRI should be accepted and implemented in Indonesia, having strong support from farmers, scientists, NGOs, private sector, government agencies and provincial, district and local governments. The Ministry of Agriculture's Directorate-General of Food Crops hosted a workshop with over 200 participants in Jakarta on June 13, with three presentations. The Minister had planned to open the workshop but had to meet with the visiting Prime Minister of Australia. His statement of support for SRI was read by the Secretary-General of the Ministry. The presentations were made by Norman Uphoff on SRI: An Available Response to Rice Price Hikes, Water Shortages, Climate Change and Rising Fuel Costs; by Shuichi Sato on Six Years of Experience of SRI Practice in Eastern Indonesia and Iswandi Anas on Some Highlights of SRI Research in Indonesia. Dr. Anas, who serves as coordinator of the Indonesian Association for SRI (Ina-SRI), reports that the presentations and ensuing discussion have helped to gain more understanding of and support for SRI among Ministry personnel and other Indonesian institutions, including private sector. In the government sector, both the Directorate of Water Resources in the Department of Public Works (PU) and the Directorate of Land and Water Resource Management in the Department of Agriculture are now supporting SRI training and extension. The Decentralized Irrigation System Improvement Project (DSIMP) of PU, supported financially by the Japanese Bank for International Cooperation (JIBC) and implemented with technical assistance from Nippon Koei, which has been focused on Eastern Indonesia will henceforth undertake SRI promotion throughout the country. The Agriculture Department's Directorate is also expanding its support for organic SRI training. The NGO Aliksa Organic SRI Consultants is operating a training center at Nagrak in West Java south of Bogor and also a branch center in Depok in the southern Jakarta region. Its activities are supported by MEDCO, a major national foundation, which also is carrying out its own SRI support activities in various places. In January, MEDCO made a grant to Andalas University in West Sumatra to support research and training on organic SRI in that region. DISIMP has established a research center on the island of Lombok with land provided through PT Sampoerna, a major tobacco company. In Bali, an entrepreneur has made 80 hectares available for growing organic SRI for the tourism industry. The Microsoft Foundation is providing computers and internet connectivity to the Aliksa centers in Nagrak and Depok. In West Java, about 10,000 farmers are using ‘organic SRI’ methods on 6,000 hectares. Both the Agriculture University at Bogor (IPB) and Andalas University in West Sumatra have research programs on SRI and are getting involved also in extension activities. DISIMP has supported expansion of SRI in Eastern Indonesia up to 5,000 hectares already, and this extent is likely to double for a number of years to come. The Indonesian Association for SRI (Ina-SRI) has been established in January, 2008, with cooperation from the Japanese Association for SRI (J-SRI). Faculty at the Agricultural University at Bogor (IPB) are managing the Yahoo group (discussion forum) for Ina-SRI which is facilitating sharing of experience and ideas among government, NGO, university, private sector and farmer participants in the group, as well as promoting collective problem-solving. This emerging constellation of SRI partners is discussed in a trip report by Norman Uphoff from his week-long visit to Indonesia in January 2008. Prof. Iswandi Anis, head of the Soil Biotechnology Laboratory in the IPB Department of Soil Sciences and Land Resources, is coordinating Ina-SRI together with Prof. Budi I. Setiawan in the Department of Civil and Environmental Engineering. To subscribe to the Ina-SRI discussion forum, see instructions on the Ina-SRI's Yahoo Group website (http://tech.groups.yahoo.com/group/Ina-SRI/) or send an e-mail to: Ina-SRI-owner@yahoogroups.com. Presiding at an 'SRI Harvest Festival' in Cianjur district, West Java, on July 30, President Susilo Bambang Yudhoyono made a strong statement of support for the spread of SRI within Indonesia and even the world, citing concerns about environmental quality and climate change as well as meeting the food requirements of a still-growing population. (See video clip as well as translations of Excerpts from the Organic SRI Harvest presided over by the Indonesian President and a Bahasa Indonesia report of the event on the president's website). The President was accompanied by the Minister of Agriculture and the Minister of Irrigation, whose respective ministries are now cooperating to extend knowledge of SRI to Indonesian farmers. The Ministry of Agriculture is funding farmer training in 39 districts in 14 provinces on organic SRI methods, both for the higher price that this rice can obtain in the market and for the more benign impact on soil and water resources. Shuichi Sato, Nippon Koei team leader for the Decentralized Irrigation System Improvement Project in Eastern Region of Indonesia (DISIMP), has sent in cumulative results from 9 cropping seasons, from 2002 to 2006. The data set includes 12,133 on-farm comparisons covering a total SRI area of 9,429 ha in Nusa Tenggara and Sulawesi regions where DISIMP operates. Average SRI increase of 3.34 t/ha represented a 78% average increase. Average wet season SRI yields were 7.78 t/ha vs. 4.56 t/ha (total SRI area was 4,380 t/ha with 5,521 farmers); dry season SRI yields were 7.47 t/ha vs. 4.03 t/ha (5,049 ha of SRI production with 6,612 farmers). The total paddy production increase attributable to SRI methods 2002-2006 was 31,697 tons (3.34 t/ha x 9,429 ha). At $120/ton, this represents an addition of $3.8 million to farmers' income. In the 2006 dry season, SRI area within the DISIMP project domain was limited to 3,758 ha due to serious water shortages in Lombok and main canal damage in the Kelara Karalloe scheme in Sulawesi. Otherwise, the project had expected that there to be a much larger SRI area last season. In West Java, organic SRI was first practiced in 2000 by Alik Sutaryat who is the top agronomist on organic agriculture in Indonesia. By a continuous effort of his group to expand organic SRI through a series of farmer training programs over 4 years, in the 2006/07 cropping season, organic SRI area in West Java has increased to 1,484 ha (5,720 farmers). In February 2007, this group has established an Indonesian NGO named “Aliksa Organic SRI Consultant" (AOSC) headed by Mr. Sutaryat. From March 2007, AOSC will commence a series of training of trainers (TOT) programs on organic SRI in 14 provinces under the SRI extension policy by the Ministry of Agriculture in Indonesia. The irrigation section of Public Works (PU) has begun training farmers in SRI methods with the main purpose of making water saving possible, although also to enhance farmers’ incomes. PU’s 2006 budget included an allocation of 1 billion rupiahs (about $100,000) for SRI training at three centers in Java and eastern Indonesia. The Bandung center is promoting the production and sale of organic (chemical-free) rice grown with SRI methods (see PU Bandung section of 2005 trip report). In a paper given at the International Dialogue on Rice and Water: Exploring Options for Food Security and Sustainable Environments, Shuichi Sato presented data from Eastern Indonesia showing an 84% yield increase with SRI that was accompanied by substantial water savings and cost reduction. Sato, who is currently the team leader for Nippon Koei's participation in implementation of a large-scale irrigation project (DSIMP) in Eastern Indonesia, presented his results at a workshop held March 7-8, 2006, at IRRI, Los Baños, Philippines. During a three-year period, SRI was evaluated to assess its potential to reduce demand for irrigation water while rewarding farmers with higher production and incomes. Comparison trials managed by 1,849 farmers on 1,363 ha and supervised by project staff have given an average SRI yield of 7.23 t/ha compared to 3.92 t/ha with conventional methods, an 84% increase. Water saving has been assessed to be around 40%, accompanied by an average reduction in costs of production per hectare of >25%. A detailed analysis of costs and benefits in the 2005 dry season in West Nusa Tenggara province calculated that the net returns per hectare with SRI methods was 6.2 million rupiah compared with 1.2 million rupiah using conventional methods. In one scheme (Batu Bulan dam irrigation), the ratio of net return was 7.3 times higher. Sato's team concluded that the economic attractiveness of SRI methods is substantial, giving farmers strong incentive to accept water-saving as the new norm for irrigated rice production. During a 2005 visit, Norman Uphoff met with several international NGOs that have been training Indonesian farmers in SRI methods since 2002. (See World Education section of 2005 trip report and VECO section of 2005 trip report). SRI was introduced in Bali province in 2006 at farmers' initiative. With hybrid rice, there was an average of 13.3 t/ha and 8.4 t/ha with standard methods. The Indonesian IPM program began evaluating SRI in 2000. Farmer Field School participants in Ciamis evaluated SRI methods in 2001 and got a 52% increase in yield, and an increased ratio of beneficial insects-to-pests, helping to explain the improved health of the SRI crop. Pest populations were about 2/3 lower in the SRI plots. 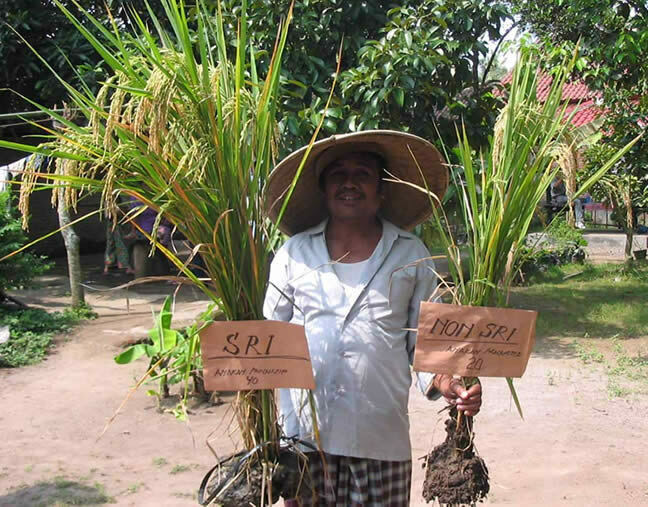 A series of four workshops held in January 2003 with Farmer Field School participants across Java found that SRI methods were averaging 9.25 t/ha. The Indonesian IPM program now operates under the aegis of the Field Foundation, continuing Farmer Field School programs with a somewhat broader agroecological focus and including SRI. Observations on the work of the Indonesian IPM program as of September 2005 are included in IPM section of a trip report by Uphoff. The NGOs World Education and VECO, a Belgian organization, began promoting SRI in 2002. Reports are available about World Education 2003 trainings. In 2002, under the Small-Scale Irrigation Management Project phases I, II and III (SSIMP-I to III) and its successor, the Decentralized Irrigation S ystem Improvement Project (DISIMP, or SSIMP-IV), staff of the Japanese consulting firm Nippon Koei have evaluated anddisseminated SRI in eastern Indonesia. A paper by NK team leader, Shuichi Sato, reviewing three years of experience with SRI, summarizes the results of comparisontrials by 414 farmers on 361.86 ha in 13 locations in two provinces (South Sulawesi and West Nusa Tenggara). The results show an average SRI yield of 9.5 t/ha, compared with 4.93 t/ha in the comparison trials with usual methods, a 93% increase. This was achieved with a 20% reduction in costs of production and an on-farm water saving of 40%. The contrast between SRI and ‘normal’ rice plants is very evident. (Click on picture to enlarge).